Here’s a recap in 7 words: my cruise line career spanned 20 years. Here’s the long version: I was lucky. Really lucky. Sure, some would say determined, but I’m going to stick with lucky. I graduated with an MBA from Thunderbird in 1983 and on my first day job hunting, in a tough job market, I walked into a cruise line and asked to speak to the president. I wanted to work for a cruise line. And not just any cruise line; one that was flagged American. There weren’t too many of those back then (none now, are there?) Said president, David Stollmeyer, hired me based on the fact that I’d written a paper in grad school on the Passenger Vessel Services Act of 1886 and I knew that American Hawaii Cruises was flagged American, sailing the Hawaiian Islands, and happened to be headquartered in San Francisco, where my then husband ( H1 ) and I called home. Mr. Stollmeyer hired me conditionally, for 90 days, to analyze his line’s passengers’ profiles and booking trends. (I told you I was a numbers geek!) If I did a good job, Mr. Stollmeyer said he’d hire me on a permanent basis. I did, he did, and the rest was history. I loved working in the cruise industry. And I loved working for small cruise lines where everyone had to wear multiple hats and be available 24/7, as they say nowadays. From American Hawaii Cruises I moved on to Seabourn Cruise Line. The legendary Warren Titus hired me even before SCL had a ship in the water, again conditionally. And again my first assignment was to crunch numbers. He wanted me to identify and contact the most likely travel agents who could sell an all-suite exclusive cruise product, meaning who had this rarified clientele. The price point (that’s jargon for retail price per person) was astronomical, and inelastic...there were few deals back then. I was ecstatic. Not because it was expensive, but because it meant marketing a product based on its merits and features, not its price. Over the years my responsibilities morphed beyond marketing to include the Seabourn Club, on-board sales, and revenue management. My boss at Seabourn was Bill Leiber, not coincidentally the past Chief Blogging Officer of Azamara Club Cruises. And let me say before I ramble off on another tangent, I am so pleased and proud to be following in his footsteps again. Bill was great; not only was he smart and devoted, but also extremely kind and funny. You couldn’t ask for a better boss. We sat down every morning at 8am to discuss the day ahead...me with my first cup of coffee. But not Bill; he’d already been at his desk for at least two hours. He just never slept; never was tired. The original ÔEnergizer Bunny’. Between the two of us we brainstormed and analyzed every marketing program, every special offer, every pricing change, and of course the annual marketing plans. We strategized with the sales teams and with our lifeblood, the travel agent community, on how to sell to the rarified cruiser who was looking for an all-suite, all-inclusive, exclusive cruise experience. It was not easy. This is a finite market, and people no matter their income want value for their dollar, which in hindsight meant Seabourn had to change to stay alive. So fast forward a couple years and it’s the mid- to late-1990’s. 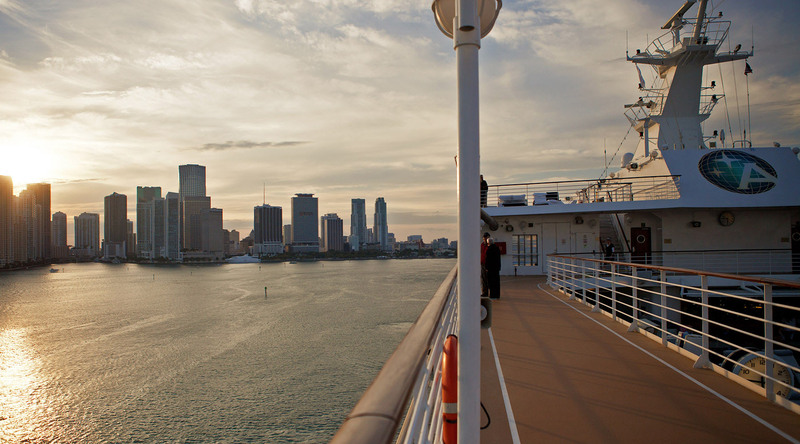 Cruise lines are growing, merging and some are disappearing. Carnival Cruise Line is on a buying spree like there is no tomorrow. First they bought 25% of SCL and remained silent partners, or so it seemed to me down in the ranks. Then, a few years later, they bought another 25%. Suddenly they were not-so-silent. Things started changing in our little 3-ship enclave in San Francisco. Meanwhile CCL had also bought the formidable Cunard Line and before any of us knew it they were merging our two dissimilar lines under one roof in Miami. SAY WHAT?? Where were the similarities? Suddenly I was the transitional Director of Marketing and Revenue Management for a fleet of seven disparate ships (the Seabourn triplets, the Sea Goddess twins, the RVL Sun, and the Cunard QEII) and headquartered on the far side of our continent. It was a sad day when I left Seabourn and all my friends and co-workers in Miami, including our beloved Bill Leiber. After a very short stint at the San Francisco Zoo (don’t ask! ), soon enough I was Vice President of Marketing and Revenue Management for a small - really small - cruise line based in San Francisco called World Explorer Cruises. This one-ship operation ran only during the summer months, in only one destination - Alaska. But was it loved by a loyal following, and was a fun job. A few years later this cruise line owner sold its ship out from under me, again...third time’s the charm. I consulted in the industry for a couple years, including at SeaDream Yacht Club, another small cruise line with a loyal following, but I knew it was time to do something else. I have had a wonderful ride. I’ve opened a book store, started a non-profit, taught at USF and SFSU, and many other jobs and life adventures with H2, including building vacation homes in San Miguel de Allende, Mexico. Now, 30 years after I brashly walked into a cruise line without an interview, I’m dipping my toes into the world of cruises again. Life is funny, isn’t it? I couldn’t be more excited to share my thoughts with you about cruising on Azamara Club Cruises, about travel and trends in travel, and about life in general. I’ll tell stories and I want to hear your stories too. I look forward to getting to know you because, believe it or not, over the years I’ve moved away from numbers and become a people person! You’ll hear from me regularly, and I’ll also be joining you on the Cruise Critic forum covering Azamara Club Cruises. As I follow in Bill’s footsteps I hope to apply all that he taught me...how to listen with an open heart & mind, and how to be proactive and keep the ball rolling ...“don’t get bogged down; get the answers and move on!”Hopefully I’ll be able to answer all your queries and questions on the forums, and what I’m hoping for from you in return is good feedback and plenty of engagement. So here’s to a Bon Voyage! P.S. Enough about me! Next week I’ll be reporting live from the Azamara headquarters located in the center of the cruise universe, Dodge Island, aka The Port of Miami.